The first lake along the trail is Arrowhead Lake, 1.2 miles up the mountain at an altitude of 9,680 feet. The trout there run small but early in the year they’re easy to catch. I haven’t stopped here in years, but when I did fish this lake I had my best luck at the inlet. There’s fish in the outlet creek, but they’re awfully small. The trail continuing up from Arrowhead Lake is a more leisurely climb on up to Skeleton Lake, a little over half a mile away. I usually don’t stop there either, but the fishing is okay for small trout. 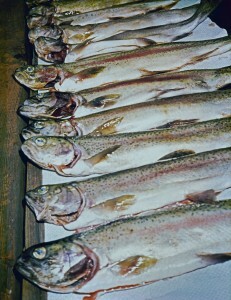 The outlet creek features lots of small trout if you prefer stream fishing. The next lake on the trail is Barney Lake, 2.5 miles from the trailhead at an altitude of 10,022 feet. Now you’re at the foot of the Duck Lake Pass trail, and this is where you have to decide to go for the big hike or to stop and fish Barney. The fish here at Barney are a little larger, but still run on the small side, although I have caught some 12 inch Brook trout at times. If you do fish here try the lake’s outlet that connects to a small pond nearby, and also fish the pond and the outlet from the pond. I’ve also done well fishing off the large rock at the head of the lake and offshore in front of the outlet creek. Still, I’ve always liked to continue on, but then I’m not as young as I used to be so the decision gets tougher every time I make it this far. 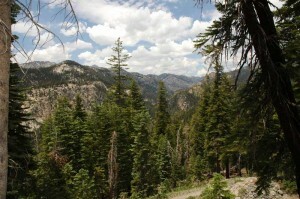 Duck Lake Pass is 4 miles from the trailhead at an elevation of 10,850 feet. The climb to the top takes some effort, but if you take breaks along the way it’s really not that bad. The view there is spectacular. You can look back towards Barney and you’ll also get a nice look at Mammoth Mountain. Looking the other way you can see the deep blue water in Duck Lake. A lot of people who are hiking and not fishing come here for lunch, and then return down the trailhead. My botanist wife also loves this pass because during this time of year, the unusual wildflowers are a rare treat and they make a good excuse for a rest stop along the way. It’s also fun to use your cell-phone to call someone at work from here, and to explain how you’re spending your day. We dedicated (another word for crazy) fishermen will continue on to Duck Lake Creek. The trail snakes down rapidly from the pass to Duck Lake where it crosses the outlet to the creek 5 miles out from the trailhead at an altitude of 10,427 feet. That’s where I like to start fishing. It’s not uncommon to bag 16 inch trout in this small stream, especially early in the year right after the snowmelt. These fish are a little different…they are as skinny as a snake and their meat is often bright red like a salmon, and of course they have more flavor. In a normal year that would be just after the 4th of July, but this isn’t a normal year. This creek will probably reach its best fishing potential near the end of July this year. You have to time it right. There’s about a three week window when the fishing is red hot, and then it cools down considerably because most of the big ones have already ended up in someone else’s creel. A word of caution, this really is a small creek to host the larger fish found here, don’t overlook it just because of its size, as some anglers do. Fish down the creek towards the Cascade Valley working the deeper pools as you go. You can continue down the creek for almost 2 miles, but remember, the creek descends rapidly, and what goes down must come back up. If you’re camping overnight it’s no big deal, but the further down you go the longer the return hike uphill to Duck Lake Pass. I have fished Duck Lake a few times, though not often. There are big fish in this lake that like to chase lures for those of you that like that option. The best locations for me have been at the stream outlet coming from Pika Lake, the small lake just to the east of Duck Lake; and from off the beach at the base of the smaller trail that leads to the left (north) out of the pass. A number of people like to fish Pika Lake, too. I’ve always loved this area, ever since my grandfather first introduced me to it as a lad of 12. I must admit that was over 65 years ago, and I don’t have the get-up-and-go I used to have way back then. Still, I fish the area whenever possible, but it takes me longer to get there and back. If you try it I’ll bet you’ll like it. But if you try this trail, do stay within your current physical capabilities, and don’t go over the pass unless you’re still truthfully the physical animal we all like to think we are. The Visitor’s Center in Mammoth Lakes has a variety of maps for the area including the trails to Duck Lake Pass. This entry was posted in Fresh Water Fishing, Mammoth Lakes Fishing Log and tagged freshwater fishing, Mammoth Lakes, trout. Bookmark the permalink.